2 brothers, Dave and Dan Morris had a passion for great Burgers and Hot Dogs. Yet, they couldn’t find anything that satisfied what they were looking for so they did what any hungry Burger-preneur does, they started their own restaurants. They saved up every dollar they had and launched a unique crowd sourcing campaign. The Morris Brothers gave Burger fans and friends the opportunity to loan the business some start up cash that could be repaid along with a donation to charity. They reached their goal and eventually opened jimmyjacks. All their food is made fresh to order from a quick service style menu. Along with Burgs & Dogs, you’ll find Grilled Cheeses, Wraps and a number of other fun side items like Mini Tacos, Corn Nuggets & Crab Cakes. So go enjoy Bryan’s jimmyjacks. It’s seriously good. I only had a few minutes to grab a quick lunch so I kept simple; a Plain Cheeseburger Medium Rare. As I looked a the menu of tasty treats I knew that wasn’t going to be enough to satiate my curiosity. I quickly added an order of Poutine. A few moments later my meal was up and my lips were a smackin’! The Burger came on a thick but soft Bun that held up through the whole Sandwich. 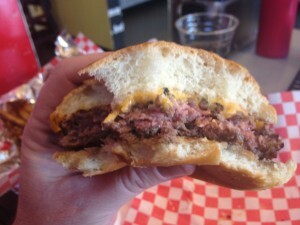 The Beefy patty had a really nice char on the outside. That’s a key element to getting the flavor of a Burger just righty. 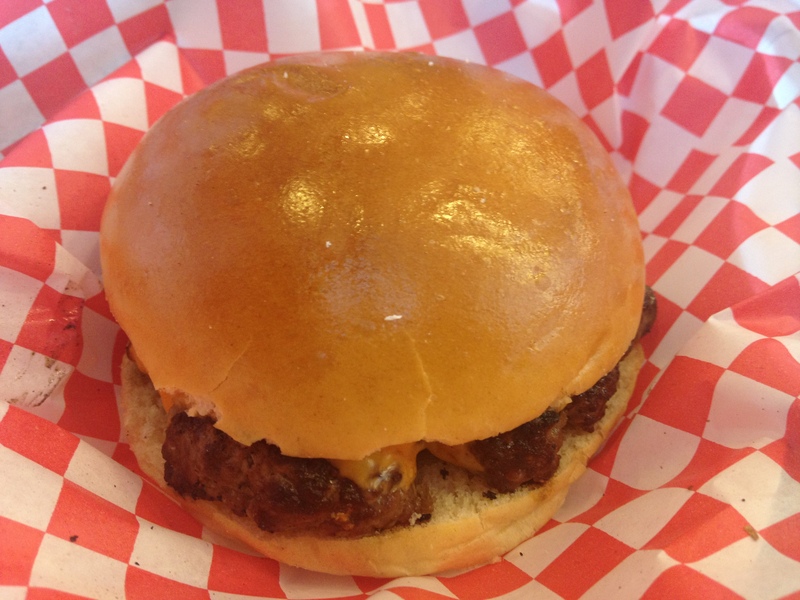 Underneath that tasty outside was a juicy and savory Burger cooked just past Medium Rare. Any Burger worth it’s juiciness has a good slice of Cheese that’s melted, salty and gives a good creamy sensation to the bite, just like the Burger at jimmyjacks. The Burger was much bigger than I anticipated, which is a good thing. No skimping on the ingredients here! As a result, I could only get down a few bites of the Poutine. For those who aren’t in the know, Poutine is a side dish Canadian in origin. 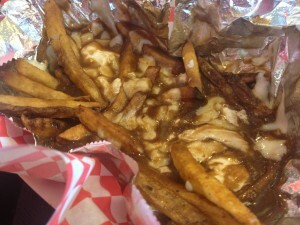 It’s made of French Fries topped with Brown Gravy and Mozzarella Cheese Curds. The Fries at jimmyjacks are made with the skin on which help to bring more of an Earthy flavor to them which I totally love. Nothing irks me more then a restaurant that doesn’t make sure an order of Cheese Fries has enough Cheese for ALL the Taters and clearly when this dish was planned at jimmyjacks, they agree. Every bite has gooey metly Cheese and or some thick, smoky and tasty Gravy. It’s a massive order so definitely bring a Burger bud to share with. If you have a soft spot for fast Food style Burgers and prefer fresh made food, jimmyjacks is your spot. This entry was posted in Burgers, Hamburgers, Long Island, New York and tagged bellmore, best burger, Bryan Copis, burger conquest, cheese, ciancio, french fries, fresh fast food, hamburger, jimmyjacks, long island, new york, nyc, rev, review, the rev meter for social community. Bookmark the permalink. 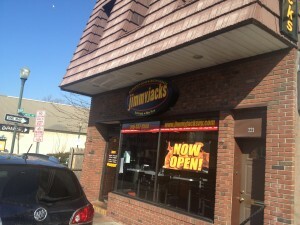 Im sorry your information is incorrect the morris brother closed Jimmyjacks in april 2012, then new ownership took over and changed everything for the better!!! !